Image: Wikipedia Commons "A map of all Superfund sites. The red dots are active sites, and the green dots are clean sites." I know that my first amendment rights do not extend to yelling "Fire!" in a building, but when the fire is happening, I have a responsibility to say so. Sherri Mitchell: "Worldwide..there's an incredible amount of land that's under the control of the military. How do we address those issues and try to clean up some of the lands?" about 900 of the 1200 or so Superfund sites in America are abandoned military facilities or sites that otherwise support military needs. 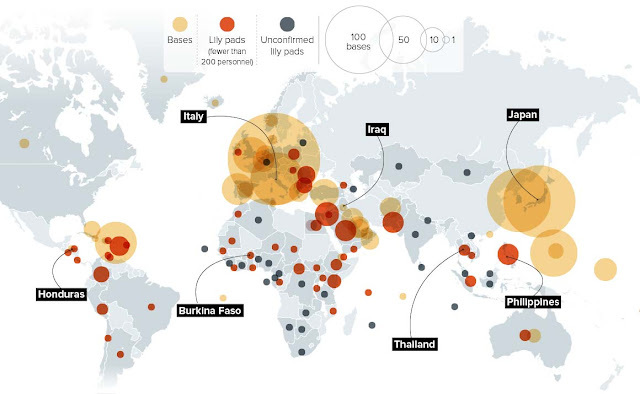 A list of military Superfund sites runs to 142 and is always expanding. Superfund sites are toxic waste locations prioritized for federally funded clean up operations. The government cannot be relied upon to solve the problem they continue creating. According to Professor Hastings: "It is 100% up to civil society to address." He was part of a coalition that successfully sought an injunction against a military base in Wisconsin that "had a very faulty environmental impact statement... Then it took the Navy about ten minutes to go down to the circuit court in Chicago...to lift the injunction." Hastings reported the Navy's rationale for lifting the injunction consisted of approximately two sentences that amounted to this: national security. This is an amazingly short sighted view of real security for the future of people residing on our planet. I think in this instance "national security" can be read to mean: securing continued business opportunities for the super wealthy who profit from the manufacture of weapons systems we all pay for. For example, real security would necessitate cleaning up superfund sites at home and contaminated lands abroad that have been pulverized by missiles made from depleted uranium. Cecile Pineda argues convincingly in Devil's Tango: How I Learned the Fukushima Step by Step that we need not fear nuclear war in our future because it is already upon us. Since the US began slowly killing its own soldiers present at the testing of a nuclear bomb in 1945, radioactive military waste that will outlive you and the next 777 generations of your family has continued to pour into our soil and oceans. Veterans and their families continue to struggle with health issues that stem from their exposure to toxins decades ago. Mothers in countries the U.S. has bombed with DU continue to bear children with severe birth defects. Still, Hastings remains optimistic about the power of the people to fight polluters in uniform: "Whichever administration is in power, we're still able to do things at the civil society level ... As long as we continue to build bigger coalitions on the ground, we can win." His view is shared by organizers like Sun and Mitchell, and by groups like Popular Resistance who build coalitions around national health, opposition to militarism, and urgent concern for the environment. Time to yell "Fire!" yet? Another helpful post. Thank you. When Americans ratchet out to the meta-view we may see some serious civil resistance. You are helping toward this. As you know, Pete, there are plenty of military bases in the U.S., too. I think the map was created to show people where all our bases on other nations' soil. And would the U.S. welcome a military base of another nation within its borders? No, but we are so very exceptional! Your comment also reminded me of the first in this series based on the podcast of an interview with Prof. Tom Hasting. He pointed out that a group of retired military leaders used to put out an alternate budget each year giving their estimate of a price tag for just defending the U.S. It was dramatically lower than the cost of keeping 800+ outposts all over the planet.